Walter Benjamin paid very close attention to the work and life of Leon Shestov. 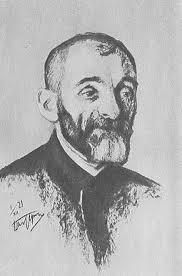 Shestov was a Russian émigré to Paris whose critical writings on literature and Judaism Benjamin had great respect for. In one of his saddest (and last) letters to Gershom Scholem, written in 1939, Benjamin writes about Kafka’s legacy to his readers by focusing on Leon Shestov’s. To be sure, Benjamin believed Shestov’s lifetime work, Athens and Jerusalem was a masterpiece. (He often mentions this to Scholem in his letters.) However, he didn’t know how it would fare in the future. In his reflection on its legacy, following Shestov’s death, Benjamin notes how Shestov’s wife, deep in mourning, cannot deal with the question of what to do with his legacy. Benjamin tells us that she lives in an apartment full of Shestov’s work (his manuscripts and unpublished essays). He muses about how one day a housekeeper will likely see that Shestov’s widow has neglected her surroundings and, while cleaning up, will throw away all of Shestov’s writings. To her, they are only pieces of paper. Benjamin likens this to the fate of Kafka’s work and adds, in addition to this, that Max Brod (the keeper of this legacy) made Kafka into a fool. To be sure, this suggests that Brod and the widow show the futility of passing tradition on. But there is more. What is passed on, by way of Benjamin, is a ruined yet comic kind of tradition. These ruined traditions (of Kafka and Shestov), fails to get properly transmitted, and their fate is comical (in a bittersweet way). In all of this, the failure of tradition is – in a way- redeemed through a comical reflection. Since Benjamin spoke so highly of Shestov and wrote of him in a tragic-comical manner, I wondered if and how Shestov would regard the comic modality. To this end, I decided to read through his collection of his literary essays entitled Chekhov and Other Essays (these articles were published while he was alive and were translated into English in 1916 – for a London press – and republished in 1966 by the University of Michigan Press). Many of these literary essays are very serious – they address the work of Dostoevsky, Chekhov, and Tolstoy, but they also address different philosophers. In these essays, Shestov reserves the comical to this or that anecdote. (His reflections, here, seem to have more of an existential tone – one that Sartre and others took to.) However, one essay in particular caught my eye as it addressed the comical. This essay was entitled “Penultimate Words.” Within this essay, the section on Heinrich Heine addresses humor. Drawing on this observation, Shestov says that same thing happened with Gogol. Like Heine, Gogol “confessed that he was describing himself” and was not mocking the Russian people in his fiction. According to Shestov, Gogol wasn’t certain of himself and, for this reason, it was simply not possible for him to contrast himself – as better off – to his fellow-Russians. On this note, he points out that Heine also had an “inconstancy of opinions”: “He changed his tastes and attachments, and did not always know for certain what he preferred at the moment”(119). He could have “pretended to be consequent and consistent,” but he didn’t. Heine’s humor, Shestov tells us, discloses a man who is “divided.” His words are a “mockery of himself.” Out of some of his comic poems and writings, we can hear “Heine’s misplaced laughter”(123). This laughter is “indecent and quite uselessly disconcerting.” Shestov puts Heine’s “sincerity” in quotation marks because Heine was laughing and at the same time embracing the possibility of sincerity. Reading Shestov and knowing that Benjamin read him lovingly, I wonder if Benjamin came across this gloss on Heinrich Heine and the comic. It would make perfect sense since Benjamin, in one of his last letters to Gershom Scholem, wonders about the “comic aspects of Jewish theology.” There is something very Jewish and very modern in Heine’s failure. It is the same failure that Benjamin comically apprehends in Kafka and Shestov. And it is the failure of the schlemiel which provides the greatest insights for them as they all realized the degree to which they themselves had failed. And, if anything, the sad laughter Benjamin had when reflecting on Shestov and Kafka was his own. It, strangely enough, gave him hope.